Idlis - (steamed rice cakes ) (linked recipe video ) . rotis n crepes too . Very cute! Lovely. Going to try it next time. Looks so beautiful .... although i have nvr tried idliss before but this image surely inspires me to try out some for my kids !!! That is so pretty! I love the story, your daughter is adorable! Wow! Smitha as usual very cute creative and artistic and beautiful ofcourse. Toooooooooo good .... such a wonderful idea truly leaves me dumbstruck . Lovely dear..I can't take eyes from the clicks..
Smita that looks lovely and very neat work on idlis. Do you make these plastic stencils at home? Thanks for all the lovely words ladies ... Do try out these fun creations & send me the clicks , I would love to post them here with a link to ur blog . @ Deepa - Hamaree Rasoi - These stencils can be easily made at home , jus require a thick plastic sheet ( X ray sheet thickness ) , (even tetra pack cartons can be put to use) Keep the plastic sheet over the pattern & trace with a fine tipped marker pen. If possible place it on a piece of glass & cut precisely with an x acto or surgical blade. A simple paper cutter blade also works fine . If stencil making sounds too tedious u can use any stencils from ur kiddos stencil drawing sets too . Lovely and creative lunchbox idea for tiny tots, Smita. 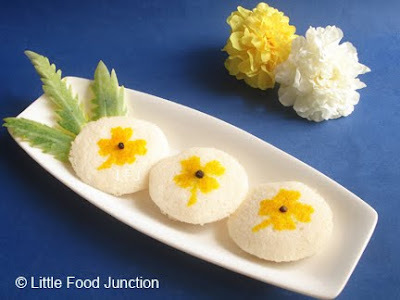 Cute idlies, kid's will definitely love this..
Never seen idlis so pretty!! those are the prettiest idlis I've ever seen! Wow, just amazing. Omg !!!!! never seen blog like dis.. u have a lot of creativity and mind blowing presentation... idli's luks very soft and yummy.. i'm sure kids love them..
What a lovely idlis. You, definitely, have a good hand on the ways to present food to kids. Nice work. These are so very cute! What a great way to keep kids interested in different foods. OMG Hats off to your patience and creativity !! Am sure any kid would love to take such tempting lunch box :) Great Work !!! I am a huge foodie - this page is right up my ally! Following you from Mom Bloggers club. Great blog! And what cute goodies!! Hi Smitha, I would like to share an award with you. Just visit my blog and grab it. Hello from France . Your blog is amazing and the recepies looks so funny. I'm sur the kids are also interrested by the colored food ! I was travelling in London this week, I have seen an article about your creative food preparation. My appreciation to you for this wonderful job. I am a widower, when my wife left us from the world my daugther was 8 months old and my son was 7 years old. 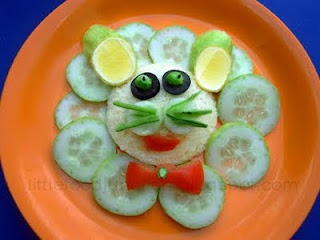 to get my daugther eat and so make her feel special, I used to make something special for lunch box every friday. Cute idlis I love the stencilling on them very innovative idea. Hi I love your blog...who would not? My daughter would be tickled pink to find such an idli in her lunchbox! I have a question...do I have to stencil on to an already steamed idli or something I am about to steam? Sounds dumb I grant u but I am a new foodie mommy :) Also do I have to hold down the stencil real tight? Thanks! Ohhh God, So Cute.. definitely Try this tomorrow..